The fragility and perseverance of humanity is most observable in the extremities of life, something usually un-confronted in Britain. 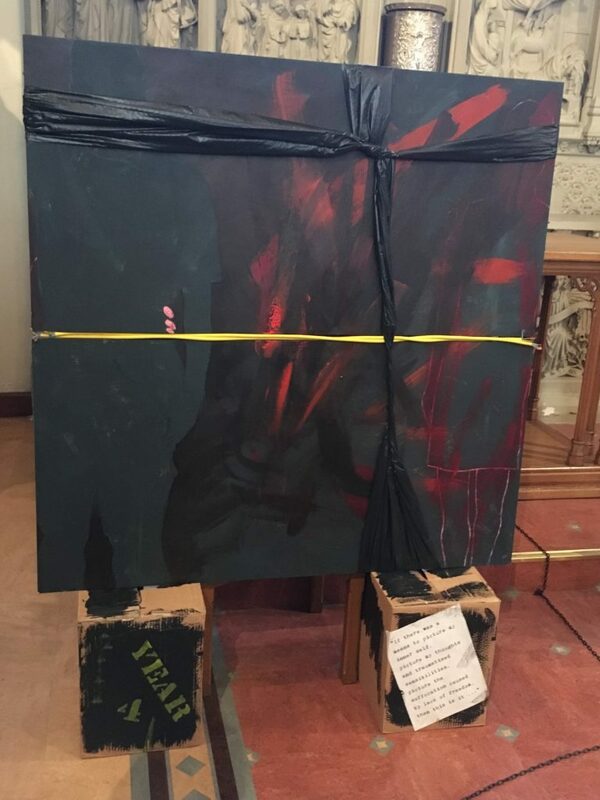 On June 22nd, the Café des Arts organised a trip to Ushaw College to give postgraduate students and the public the chance to see the opening night of local artist Alan O’Cain’s most recent work. However, this was not the usual exhibition for a U.K. audience. Instead, attendees experienced a modern-day Shakespearean narrative of desolate tragedy tucked away in an unassuming collegiate chapel. The evening began slowly, as people filtered through to a large and well-lit lounge within Ushaw. As-per-usual at these events, drinks were freely offered, and people began to sip wine and mingle with one another in a civilised fashion. This was, however, a fleeting moment of niceties, for as Alan began discussing the exhibition it soon became clear that it was created neither for nor from any courteous pleasantry. 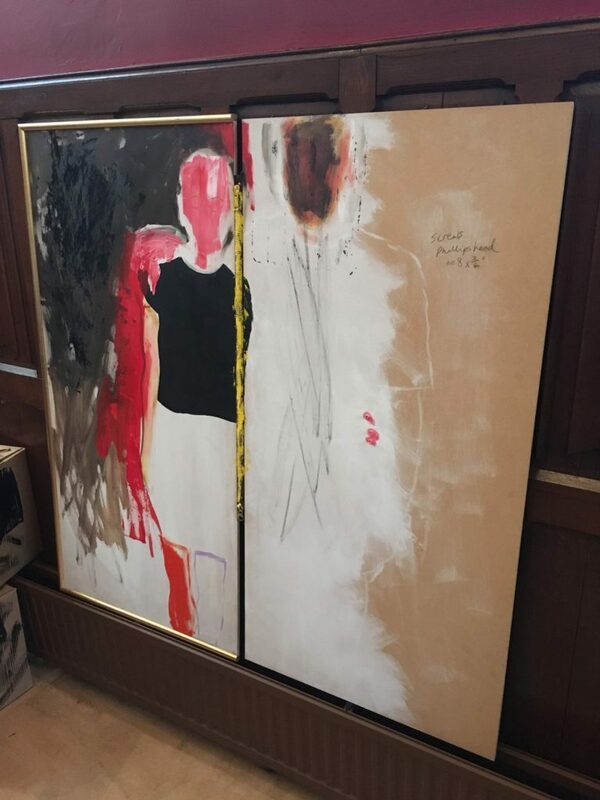 The paintings originate from an ongoing collaboration between Alan and a British former banker who pled guilty to securities fraud in 2008 (which was backdropped by the world’s banking crisis). The anonymous subject of these paintings is currently in his sixties, and is serving a sixteen-year prison sentence in a United States jail. He is a university graduate, a father, a former art collector and previously a successful corporate banker, who has no opportunity for parole before serving a minimum sentence of fourteen years. Alan’s project is to create a painting for every year his subject remains incarcerated. 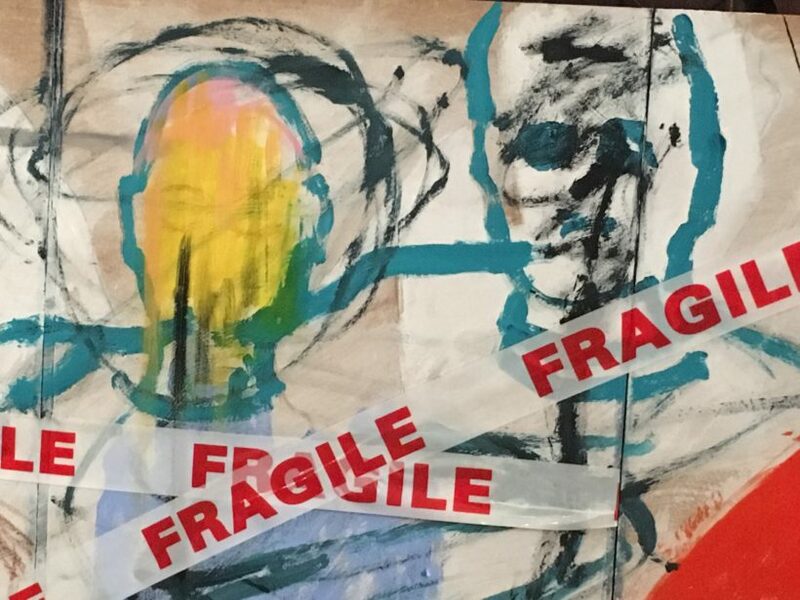 Each four-foot square work (interestingly, Andy Warhol’s preferred sized canvas) is inspired by the emotional and intellectual content of their correspondences. A single photograph taken of the subject and his wife in their beautiful garden, a symbol of the joy he once experienced, is repeated, again and again, in each year’s painting. This poignantly references both the inner-life of the inmate’s relationship to the external world and his fading place within this existence. Alan completed his speech by playing an eight-minute-long cello recital of torturous and emotionally evocative sounds whilst he read out one letter by the inmate. In this letter the audience discerned both the complexity of the subject and his involvement in Alan’s work, referencing a recent example that he had seen: “Then there is the black. Is the space growing or shrinking? We must think positively because rather than a suffocating vacuum the space contains a hint of colour. That means life, surely.” A discernible mood of emotional unrest and unease was felt, and at this point we were taken into the chapel where the cello recital continued, enhancing an atmosphere of both heightened concentration and discomfort. The cycle itself begins with a painting of two halves, connected by a zip in the centre of the panel. Already the subject is visible only faintly, a ghostly apparition compared to the strong outlines of his wife; faceless features serve to heighten the de-humanising process, accentuated by usually unseen-every-day objects placed externally to reference the interior-life ripped out externally. In the fourth year’s panel the tone turns to a sombre black. Here, the use of a bin liner wrapped around the subject’s face emphasises the sensation of his interior suffocation during a two-year state of intense depression wherein no letters or communication occurred. Alan manages to create with this evocative exhibition a real sense of emotional desolation, depression and imprisonment. Fortunately for us, the exit was ready for when we wished to withdraw. Unlike the subject of this painting cycle we were, thankfully, not trapped in this unsettling world, but free to depart and enjoy normality once again. For those who would like to visit and experience this exhibition themselves, however, it is on until August 31st.